I wonder if the writers knew just how disparate the reaction would be between people who have seen Frontier (and to some extent, Zero Two) and people who haven't. For those who aren't aware of his role in Frontier, Lucemon comes across as an adorable, ambitious voice of reason. Seeing the people come around to his point of view is downright inspirational. Those of us who have seen Frontier are screaming at the TV as the Fusion Fighters help Senator Palpatine become Emperor Palpatine. Of course, they have no way of knowing Lucemon's true nature. How we perceive this episode does depend a lot on our knowledge from previous series, and it kinda works either way. Now if you're new to the show, or didn't get through Frontier, or didn't catch on that Lucemon is derived from Lucifer... yay democracy! The tyrant SlushAngemon is deposed and the Fusion Fighters help strike a blow for freedom! And yet, as naive as that outlook is, it's also the same perspective that doesn't recognize how meaningless this zone appears. 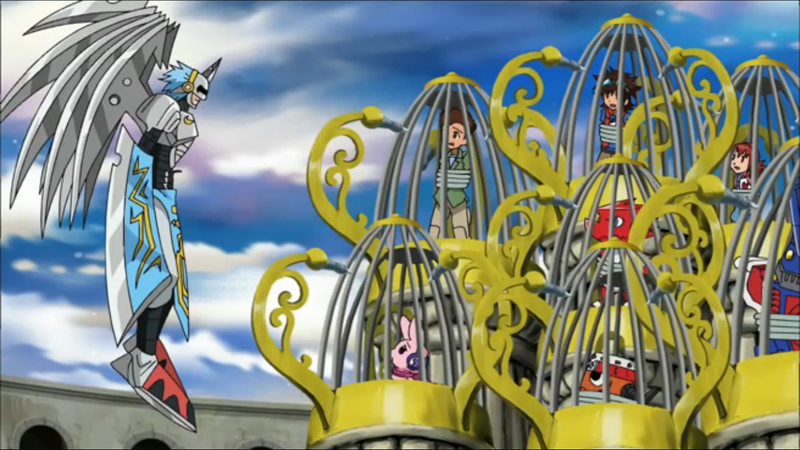 They know that something significant will happen in the next episode; even if it's not Lucemon being duplicitous, they may suspect SlushAngemon or Shakkoumon of having ill intent. Next episode's reveal may expose them as a bit gullible, but they're right in that it'll be a big deal. Either way, it's a set-up episode and while it's very limited as to how much emotional impact you're going to get out of it, it does its job competently. These last few zones have done better showing their cultures independent of what the Bagra Army has been doing to them. Last time we had the land become a desert wasteland since the fall of Silicalia. This time it's either a utopia or a dystopia depending on who you ask. If you like rigid order, security, and the peace of mind to create your oddball masterpiece in solitude, you're in luck. If you don't like walking on eggshells every day and fear accidentally breaking a rule and being executed... maybe not your place. It's not the most complicated bit of world creation, but there's a very good freedom vs. security debate going on here, which is impressive in a pinch. With this sort of premise, it's only a matter of time before the Fusion Fighters run afoul of the law. 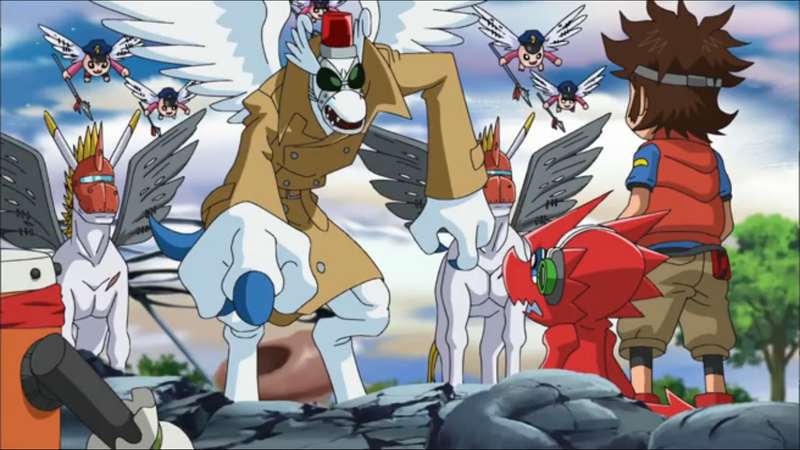 Dondokomon ends up being the primary offender, nice to see as it's the first time Dondokomon has done anything. Mikey's passionate defense of Dondokomon (and later of the Kyupimon that took the blame for breaking the statue) is a more natural way for him to demonstrate his creed without making a big show of it. It also gets the whole team into trouble with the law and the inevitable trial by combat. It's disappointing that it's only after they defeat SlushAngemon that the people turn to Lucemon. That seemed to be a case of needing to throw Shoutmon X4B out there at the expense of a good story. So we're running with SlushAngemon because that's what the dub's running with. It had to have been mandated by censors to change it from SlashAngemon (very harsh, that), but Slush is real lazy. Makes you long for the days of Citramon, doesn't it? They're really paying only minimal attention to that whole “no Digimon travel between zones” thing. It's like they've already recognized how many plotholes that creates and have more or less dropped the subject. Just as newcomers to the series might not recognize Lucemon as a bad guy, they also may not assume Shakkoumon's a good guy at first glance. Even Zero Two vets shouldn't assume he's a good guy since he has quite the poker face and he's hella creepy either way, but the same principle is at work. Gargoylemon's Arnie impression isn't jarring so much for the Arnie impression, but that they've never done one on the show before. The Fusion Fighters are cleared of all charges once Kyupimon confesses. This makes no sense. Even if this absolves them of the statue vandalism, they're still guilty of obstruction of justice, escaping prison and walking on the grass. Nice little late character note of Mikey preventing Shoutmon X4B from killing SlushAngemon. Because X4B was gonna. Mikey also trusts Dondokomon completely, despite him being a starting team member that Mikey's never really interacted with. Since Datamon handed over the reigns, the Digimon Data Collection segment at the end have made some very unusual choices on who to profile. This time it's AncientVolcanomon, who died six episodes ago. Nice review, as usual. I think I would have given it something like a b as well, both for entertainment value and because it does show a fair bit of potential at times. 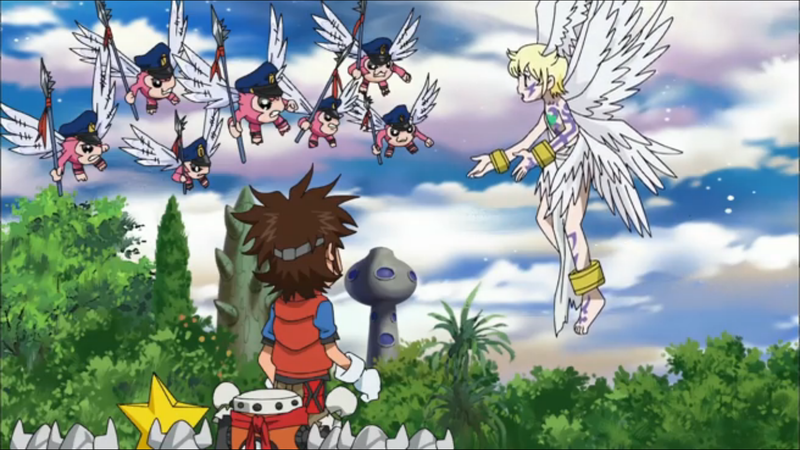 That said, wouldn't it have been weird if Lucemon actually WAS a good guy in this version? I know he's not, since I've seen upcoming episodes, but I admit that would have thrown me for a loop. "Even if this absolves them of the statue vandalism, they're still guilty of obstruction of justice, escaping prison and walking on the grass." I thought Lucemon talked Gargoylemon out of the grass-walking incident. In any case, the Sky Zone police seem to treat art as Serious Business, so from their POV, everything revolves around that incident. Also, d'anyone else get vibes of Last Action Hero whenever Gargoylemon spoke?